Zap touchscreen germs with this UV sanitizer that takes care of the dirty work for you. Your handy electronic devices have one unwanted function: they’re a breeding ground for bacteria. 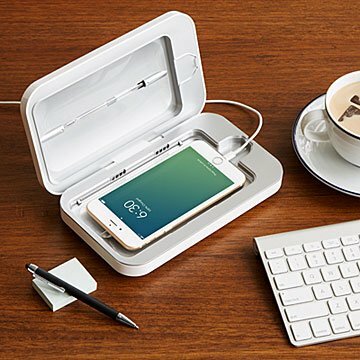 This easy-to-use sanitizer and charger helps zap most of those germs. Simply place your device inside, attach the included charging cable, and close the lid. Ultra-violet lights do the dirty work. The case even has built-in acoustic amplifiers so you can keep listening to music or use your phone's alarm while it's getting its spa treatment. Choose the standard size for your phone and XL for tablets, remote controls, and other larger electronics. Made in China. Click here to see how dirty your cell phone really is. PhoneSoap Smartphone Sanitizer fits all smartphones. Very useful gift because phones harbor so many germs. Other items can be cleaned as well. Who knows if this device really kills germs? One would have to culture their cell phone, and see what grows out, in the laboratory. It's a novelty, but a good one. My gift was a big hit! I'm so happy that I could send one simple to use gift that provides my, germ-phobic/employed in the medical field, daughter piece of mind emotionally and also serves a real purpose in her life! You can only send so many lotions, wipes and positive notes.... I feel like this was taking real action! She absolutely loves it! It was the hit of Christmas morning! It's an overall appealing gift to give the particularly special people in your life. I think about the gifts I give, sometimes too deliberately. The Phone Soap didn't take any deliberation at all! This one says to the giftee "you are cool and please stay healthy. I really care about you." I knew it would be the hit of the holidays and I would once again reign supreme this year as Super Aunt. Loved it and will be used often. This is a cool gift. I wish there was some way to tell how dirty it was before and then after so that one could really tell it is working. Good for quick and complete phone cleaning. Charging possible at the same time. Really neat gift for everyone! I work in a hospital and goodness knows how much germs are present there! It gives me outrage of mind that I can sanitize it phone whenever i need to. Added bonus is when I put my phone to my cheek (whenever I forget to use my headset), I don't get any break outs!